ROBsessed™ - Addicted to Robert Pattinson: Robert Pattinson talks about that epic red carpet look from his Harry Potter days. You know the one. 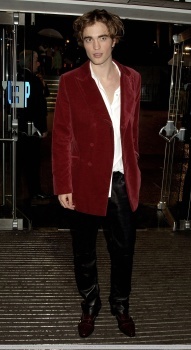 Robert Pattinson talks about that epic red carpet look from his Harry Potter days. You know the one. I was always fond of this look...uh...I mean, choice. It’s so insane and confident. 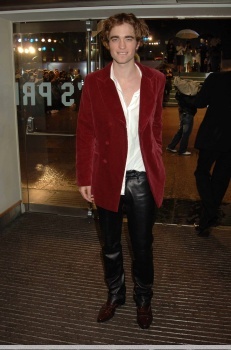 Black leather pants and a poor fitting red velvet jacket?? Those boots? The sloppy, barely buttoned white shirt? How utterly wild. It made me adore Rob more when I first saw it. Who is this guy who would wear this?? He’s wonderfully unique, that’s what he is. Click HERE for a gallery down memory lane. 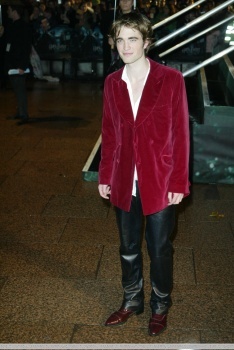 Now, over 12 years later, Rob mentions this sweet sartorial rebellion of his. Rob is the best. Always. Click HERE if you missed the pics from W magazine, sans epic quote.